Have you tried every possible way to lose weight? From myriad dieting plans suggested by family and friends or the Internet to heavy duty gymming sessions, you have done it all, but they have been off no use? Getting that hot body to die for is still a distant dream for you? Well, no wonders that you are still falling prey to common weight-loss myths. Myth buster: If you think that crash dieting will help you cut the flab, you must hear this. “When you starve, the body gets into a mode so that when it starts eating the muscles instead of fat leaving you undernourished and week,” explains Ritu Seth, author, The Art of Staying Young. “Starving doesn’t work for more than a week as after that body picks up the biological response and soon your metabolism goes down and hunger increases,” says dietician Dr. Shikha Sharma. Tip Time: Don’t starve and keep your body well fed all the time. Rather than stuffing yourself with three bulky meals or starving to the max, opt for six small meals spread across the day. carb-free diet and still failing to find any hope on the weighing scale. “All carbohydrates are not bad. In fact one must have some amount of carbohydrates because good carbohydrates slow down the digestion process keeping you feeling full for a longer time. Whereas, a carb-free diet or a diet with a bad-carb digests fast making you feel hungry and crave again for food. Slow-digestion is very important to lose weight, as it slows down the release of Insulin and it is then that Glucagon burns the fat from the body,” explains Ritu. Tip Time: Bread is a form of bad carbohydrate, as it digests fast, while cauliflower is tagged as a good carbohydrate. Also, a chapati, decently oiled with olive oil is better than a thin oil-free chapati as the former will take time for digestion. Tip Time: Fruit juices come to fore as the best weight loss food for those looking out for consuming less calories, but they can never let you lose weight. So opt for fresh fruits instead. Myth buster: You are not doing any good to your weight loss regiment by skipping meals. “An acidic body compensates for a skipped meal by getting bloated. And also, once you take the next meal, the body gets into the compensatory mode and you over eat, explains Shikha. Tip Time: “Eat food that’s compatible to your metabolism. To know that one can either take expert advice or and easy way out is to maintain a food journal, where you pen down everything that you eat together with recording your weight and measurements. And soon you’ll know how your body reacts to different foods,” shares Shikha. Myth buster: Here’s a revelation for all those who think only sweating leads to weight loss. “Sweating has no relationship to weight loss when exercising. Perspiration while exercising occurs to cool down the body that gets heated up. Also, everyone has a unique sweating pattern,” says fitness expert Kiran Swahney. Myth buster: Most of the dieters perceive that to ward off body fat, it’s necessary to cut down on fat content from their diet, which is a myth. “Our body requires a decent amount of fat for maintaining a healthy state. Cutting the fat altogether can lead to hormonal imbalance and diseases there after. 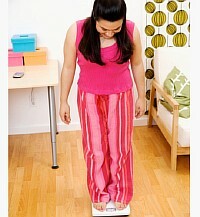 So choosing the right amount of natural fat is the key to weight loss,” suggests Shikha. Myth buster: “As suggested by a weight loss center, I started drinking hot water post every-meal. But it did no good to me,” shares Anamika Goswami, a Delhi-based teacher. “One must understand that water is one component of an over all weight loss program. Banking only on water doesn’t help,” informs Shikha. Tip Time: One must drink plenty of water as most of the body-functions work with that medium. “But don’t think more water will flush out the fat, though it will definitely do away with the toxins accumulated in your body,” explains Ritu. Myth 8: Battle ends with losing weight. Tip time: It’s important to understand the reason behind your weight gain and target it. Know your food compatibility. Remember that weight gain is far more than the mathematics of calories in and calories out. What Do LGBT Rights Have To Do With Sandwiches?